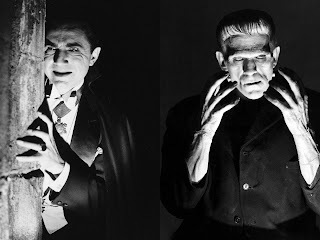 Dr. Gangrene's Mad Blog: Drac and Frank 80th anniversary event! The 80th anniversary of Dracula and Frankenstein are upon us! In celebration, the Pomono Fox Theater In Pomona, CA is showing both films in their entirety!! There will be lobby displays, doors open at 6 - Dracula screens at 7p, then onstage discussions about the films by film experts, then Frankenstein rolls at 8:45p. Event wraps at 10p. Boy I wish I lived in the area. Definitely make plans for an evening of monsterific fun on Saturday, Feb 19th, if you're in the area!! This poster was created by my buddy Scott Essman at Universal.